"Women, don't get a tattoo. That butterfly looks great on your breast when you're twenty or thirty, but when you get to seventy, it stretches into a condor." The San Diego Zoo Safari Park (formally known as Wild Animal Park) outside of Escondido, California, will be hosting its annual Butterfly Exhibit April 5-27. If you're planning on visiting the park, March and April are the optimum months to visit, as the weather is Goldilocks perfect: warm and balmy coupled with a refreshing afternoon breeze. Come in April and you can see the Butterfly Exhibit! I'm still pissed off with the City of Laguna Beach for not allowing volunteers to maintain the Alta Laguna Park Butterfly Garden, and for allowing it to go to pot; no, they didn't turn it into a dispensary. 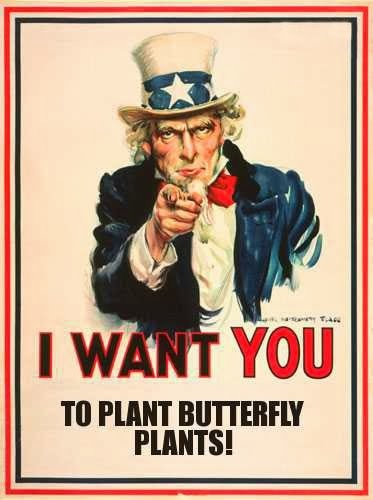 On the other hand, the City of Huntington Beach has been quite gracious in allowing Leslie Gilson to successfully spearhead efforts to create a butterfly garden in one of their city's parks. Kudos to local gov't. and volunteer efforts in turning what was basically an abandoned community park into a maintained and viable butterfly habitat. The City of Laguna Beach had an existing butterfly garden already in the process of maturation. Its positive effect on the local butterfly populations was dramatic, plus those who happened to stumble upon the garden derived much pleasure out of it. What at one time was a biotically sterile monoculture slope of prostrate acacia ground cover, was transformed into a viable butterfly habitat that was diverse for other insects and birds to boot. I haven't laid eyes on it for over half a year now; it didn't look good then, and I'm sure it doesn't look any better now. No one who knows the garden and me (Me? Myself? I? The butterfly dude? English grammar sux.) has commented on its status, so it can only be assumed that nothing has been done to it to improve it, let alone maintain what may be left of it.